The picture above is a double recipe. This cake is a triumph – so easy, and it never fails to please. Pour the batter into a double lined 20cm deep cake tin, and bake at 150 degrees celcius for 1 3/4 hours. **check cake towards the end so it doesn’t overcook. I also made some chocolate leaves by melting dark chocolate and using a clean paint brush to paint camelia leaves. Just peel the leaf away carefully when the chocolate sets. Ivy leaves also look brilliant, but the cows ate my ivy, so camelia leaves had to suffice. Any non-toxic leaf will work. Then I used smarties (chocolate beanies) to make flower patterns. It looks a bit like I channelled my inner 1950s housewife, don’t you think! This entry was posted in Cakes and desserts, Food and tagged birthday, celebration, chocolate cake, chocolate mudcake, family, food, ladies lunch, love, recipes, sharing by Cauldrons and Cupcakes. Bookmark the permalink. That looks ridiculously awesome – I’m so impressed! And ridiculously easy. Honest. But I think it’s cool my cake impressed you 😛 Thanks for dropping by! 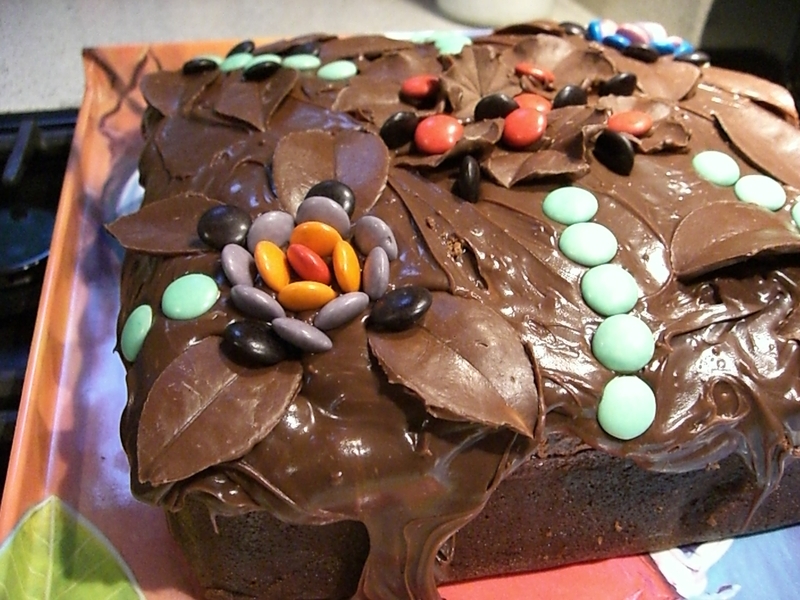 I gained 2 kilos looking at your cake image,yummy! What a beautiful cake! I love learning how you made the leaves. Thanks Emmy! My mum taught me when I was a little girl. Making them always reminds me of my childhood and getting ready for parties! Aw, that makes it even sweeter if they are a good memory of your mom from your childhood. 🙂 Thanks for tweeting the real food love today! What a lovely cake! I’m actually baking a chocolate cake for a 4-year old neighbor this weekend and this amazing cake of yours is just a timely source of inspiration. Thanks a lot!